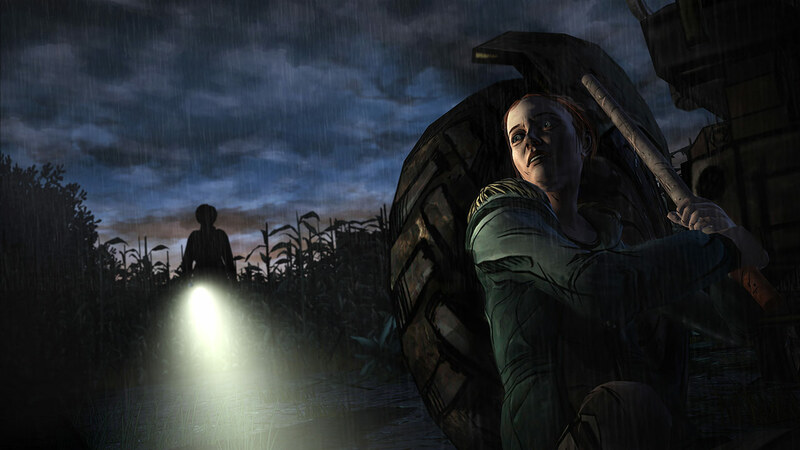 Telltale’s game, The Walking Dead, was by far the surprise gaming hit of the year last year, earning awards and accolades from every corner of fandom imaginable (my review included). They managed to create a game that was both original in it’s execution, and shockingly emotional, by keeping true to the spirit of the source material without having to copy or reiterate anything that had been done previously with the series. It was released as a series of five episodes, once every two months or so, and wrapped up it’s first season in a haze of tears and horror, leaving those of us who played craving more. Telltale listened… and even though a second season was announced rather early in the first season’s run, I was amazed to hear a few months ago that they would release a DLC titled 400 Days ahead of the second season as a bit of a primer for what was to come next… and to cover the first 400 days of the zombie outbreak. The DLC was released last week (I didn’t realize this until yesterday), and it’s an incredible piece of work and a wonderful addition to Telltale’s game, as well as to the entire The Walking Dead universe. The gameplay is identical to the first season’s, but the structure of the story is quite different. It doesn’t take off from the end of the first season… the fate of one particular character from that season is still unknown… but instead, gives you the option to play one of five characters, each of whom’s stories are about 15 to 20 minutes long, and each character is at a different time point along the 400 day scale. In total, the game took me about an hour and a half to complete… and in that hour and a half I found myself engrossed, terrified, and eager to put all the pieces together. Each vignette is related to the others, but it’s never spelled out exactly how until you begin noticing certain places or people showing up, as well as a few familiar locations from the first season… and by selecting each of the different characters, you don’t know who they are, or how they relate to the others… and more importantly, when you select each character, you won’t know how many days in you are. For instance, one of the character’s stories occur 2 days into the outbreak, another doesn’t happen until 220 days in… and like the first season, how you begin the game not knowing why Lee was headed for prison, you don’t know anything about these people until you move through the story and are forced to make decisions based on the moment at hand, and may find yourself surprised when you discover the whole situation. I see no need to go any further into any specifics… if you played the first season you will definitely want to download the DLC immediately. It’s a short investment of time for an incredible emotional payoff in the end… that again, will leaving you craving more… and excited for what season two will bring. If 400 Days is any indication, season two is going to be a doozy. PS: For those of you who may be interested, I am going to be having another podcast chat with Jason on The Walking Dead’Cast tomorrow and will be discussing this game as well as an in depth, very spoilery discussion of The Last of Us. Now that we’ve both completed the game, we have a lot more to say that we couldn’t in our previous chat… stay tuned for more info on that, and The Walking Dead’Cast party in San Diego next week… everything is coming up undead these days!! Next The Walking Dead’Cast: Episode 108: 4, 8, 15, 16, 23, 42, HIKE!